In 2015 the College of Policing published its Leadership Review with specific reference to the type of leadership required to ensure that the next generation of Chief Constables and their management approach will be fit for purpose. Three key issues were highlighted as underpinning the effective leadership and management of contemporary policing: hierarchy, culture and consistency. Yet these are not just relevant to modern policing, having appeared as constant features, implicitly and explicitly, since the creation of the first provincial constabularies in 1835. 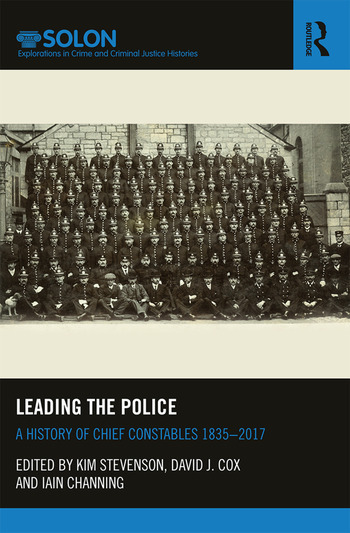 This collection reviews the history of the UK Chief Constable, reflecting on the shifts and continuities in police leadership style, practice and performance over the past 180 years, critiquing the factors affecting their operational management and how these impacted upon the organization and service delivery of their forces. The individuality of Chief Constables significantly impacts on how national and local strategies are implemented, shaping relationships with their respective communities and local authorities. 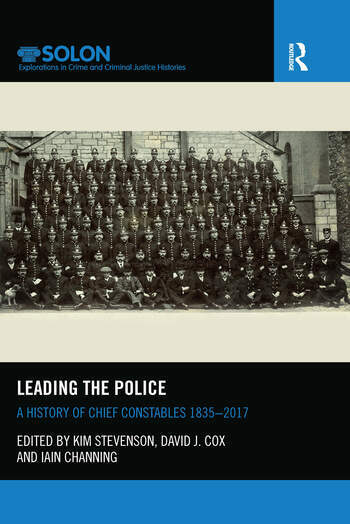 Importantly, the book addresses not just the English experience but considers the role of Chief Constables in the whole of the United Kingdom, highlighting the extent to which they could exercise autonomous authority over their force and populace. The historical perspective adopted contextualises existing considerations of leadership in modern policing, and the extensive timeframe and geographical reach beyond the experience of the Metropolitan force enables a direct engagement with contemporary debates. It also offers a valuable addition to the existing literature contributing to the institutional memory of UK policing. The contributors represent a range of disciplines including history, law, criminology and leadership studies, and some also have practical policing experience. Kim Stevenson is Professor of Socio-Legal History at Plymouth University, co-founder SOLON: Interdisciplinary Studies in Law, Crime and History, General Editor Routledge SOLON: Explorations in Crime and Criminal Justice Histories and is also a former Police Sergeant. She has published widely on historical and contemporary aspects of crime and the criminal law including Public Indecency in England 1857-1960 [with D.J. Cox, C. Harris and J. Rowbotham] (Routledge, 2015); Crime News in Modern Britain: Press Reporting and Responsibility 1820-2010 [with J. Rowbotham and S. Pegg] (Palgrave, 2013). David J. Cox FRHistS is Reader in Criminal Justice History at the University of Wolverhampton, co-director SOLON: Interdisciplinary Studies in Law, Crime and History and General Editor RoutledgeSOLON: Explorations in Crime and Criminal Justice Histories. He has published widely in the field of criminal justice history and the early history of the police: Crime, Regulation and Control during the Blitz: Protecting the Population of Bombed Cities [with P. Adey and B. Godfrey] (Bloomsbury, 2016); Public Indecency in England 1857-1960 [with K. Stevenson, C. Harris and J. Rowbotham] (Routledge, 2015); Victorian Convicts: 100 Criminal Lives [with B. Godfrey and H. Johnston] (Pen and Sword, 2016); and Crime in England, 1688-1815 History of Crime in the UK and Ireland series (Routledge, 2014). Iain Channing is a lecturer in Criminology and Criminal Justice Studies at Plymouth University. He is an interdisciplinary scholar whose research crosses the fields of Criminology, History and Law. His publications include the monograph The Police and the Expansion of Public Order Law in Britain, 1829-2014 (Routledge, 2015) which underlines his interests in police history, public order law and political extremism. These interests were established in his doctoral research on the legal responses to Sir Oswald Mosley’s British Union of Fascists (Plymouth University, 2014). He has presented his research at various conferences across the UK and teaches across a broad range of areas which traverse crime history, contemporary policing and the criminal justice system.